Welcome to our Technique Blog Hop! This month there are 13 of us highlighting the Ghosting Technique as shown on page 45 in the 2011 Autumn/Winter Idea Book! The basics for this technique is to stamp an image with VersaMark ink, emboss it, then sponge around the image with a contrasting ink to create a negative image. This blog hop is a circle so you can start wherever you want and continue through to see all the fabulous artwork incorporating this technique. If you are coming from Shirley’s Blog, you are on the right track! All supplies are Close to My Heart: Zippidee Paper Packet, Zippidee Fancy Fuzz, Indian Corn Blue ink, Cranberry ink, Rustic Numbers stamp set, Argle Backgrounds stamp set, Save the Date stamp set, Cricut Art Philosophy Collection, and antique brads (Brads-Metal Assortment). 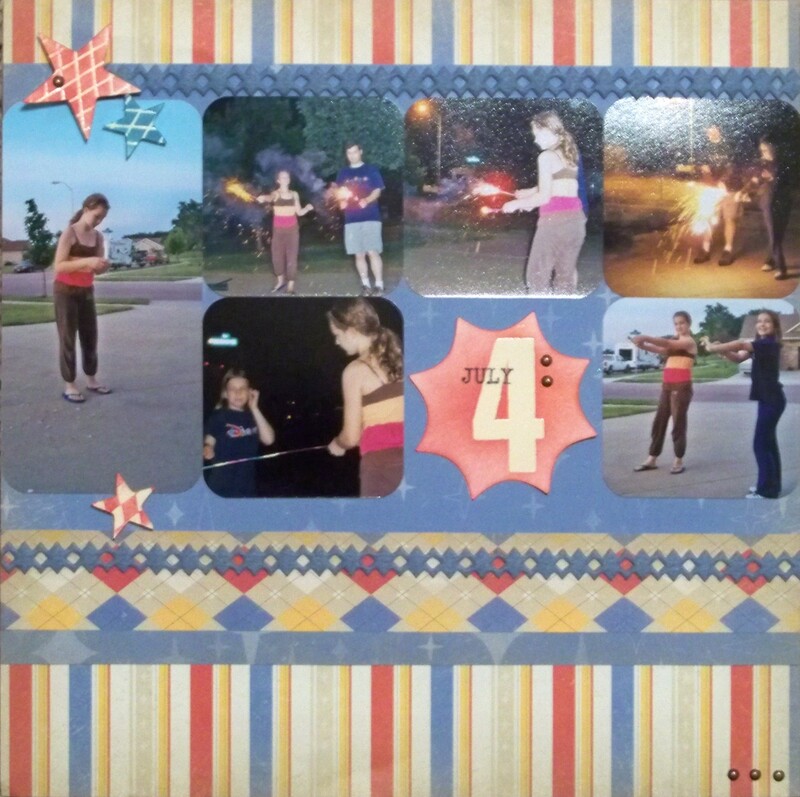 I cut the stars with my Cricut, then stamped on them with the Argle Background stamp, heated and sponged the color. For my title, I did the same thing but I used StazOn ink for the July. Stamp images after embossing, making them look like they are in the background (without having to use masking). Use a variety of different embossing powder colors for even more flair. If you don’t have the color of embossing powder that you need, you can stamp the image like normal, then stamp again overtop with Versamark and emboss it with clear powder. Thanks for stopping by! 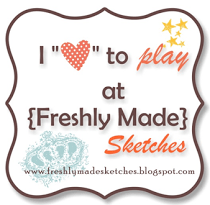 Please continue on to Tracey’s Blog where you will find some additional artwork highlighting this technique! Be sure to leave a comment and let me know what you thought of my variation and happy hopping! This is a list of participants for the November 2011 Ghosting Technique Blog Hop. Welcome to the November 2011 Close to My Heart Spotlight Blog Hop! This month we are embossing! There are different types of embossing (dry or wet). Normally, when I think of embossing it’s the technique I used below where you use embossing powders, a type of wet (slow-drying) ink, and a heat gun. 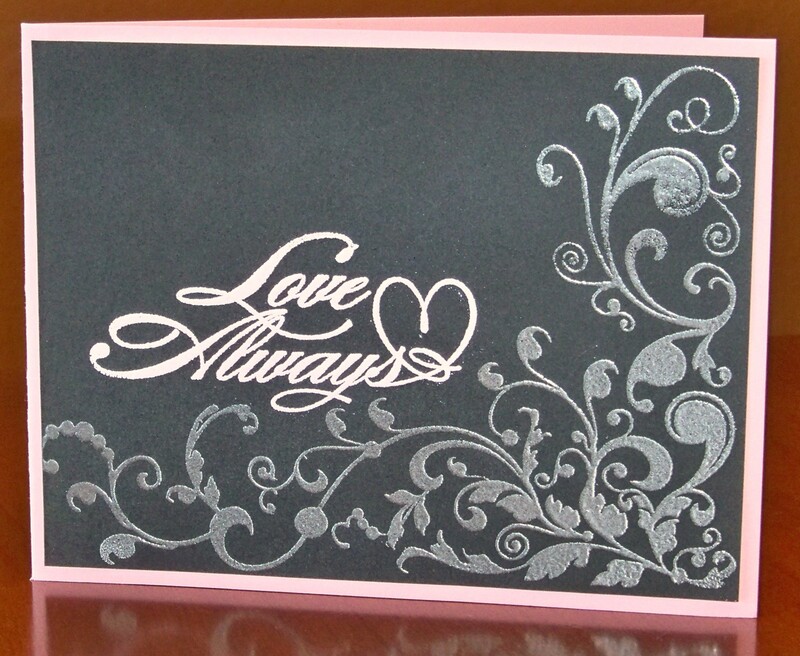 There is also dry embossing where you use a stylus or fancier embossing folders to create a raised look on your paper. This blog hop is a circle so if you are just starting, continue until you make your way back here. If you are coming from Tamatha’s Blog, you are on the right track! Supplies used are all Close to My Heart unless otherwise noted: Black Cardstock, Baby Pink Cardstock, Baby Pink Embossing Powder, Silver Embossing Powder, Versamark Ink, Key to My Heart stamp set, and Love Always stamp set. I do not emboss very often but I do like the look of it. This card has a very elegant look and only took minutes to make. Wendy K.   <---You are here!